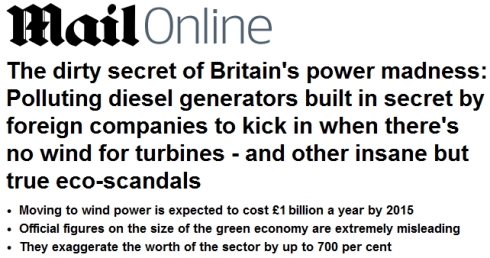 Following the exposure of the rapidly growing use of diesel generators, to provide energy when the wind doesn’t blow to turn those intermittent and inadequate turbines, the story revealed by Richard North and Christopher Booker in being brought to a much wider audience via the Mail on Sunday today, courtesy of James Dellingpole. The National Grid’s eye-wateringly expensive solution to counter the instability of wind power is known as the Short Term Operational Reserve, or STOR, to generate a reserve capacity of eight gigawatts (GW) by 2020, the equivalent of about five nuclear plants. The diesel-generators will provide immediate computer-controlled back-up for that significant period when the wind turbines are not working, but at a hefty premium. 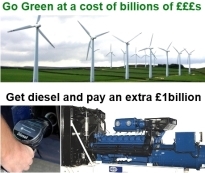 Currently the wholesale price for electricity is around £50 per megawatt hour (MWh) but diesel-generator owners will be paid £600 per MWh. At 12 times above the market rate, this represents a bigger cash bonanza even than that currently enjoyed by wind developers, who receive a subsidised price of between two and three times the market rate, depending on whether their turbines are on land or offshore. With the huge reach that can be achieved by the Mail due to its millions of online readers, the STOR scandal is starting to gain some traction. This increased attention will surely lead to more scrutiny about why the UK is decommissioning coal and nuclear power stations to be replaced with ineffective wind turbines, that in turn rely on hugely expensive, CO2 emitting diesel generators as back up when electricity demand exceeds what can be supplied. The detail that should make people’s eyes open wide in disbelief is that in 2010, the scheme was already costing us £205 million a year, yet by 2020 this is expected to rise to £945 million. All this money being taken from us in addition to what was already being taken to fund our energy needs – and it is only being taken because the politicians have wantonly abandoned reason and made us increasinly dependent on the least efficient, least reliable and least affordable form of power generation, which necessitates diesel generators to be on standby to make up the shortfall when the wind drops off. To call this a scandal doesn’t come anywhere close to underlining the scale of this corrupt rip off or the extent of the carbon con that is being used by the government to enrich corporates at our expense. A thought occurs, the government has signed up all its backup generators to the STOR scam, but, our taxes paid for the generators in the first place. Having now signed the contract the government get a payment every year based on the reserve size plus the extra when they actually work, every penny of which goes on our electricity bills. So we all end up paying twice to get the government out of a hole of their own making. There is also the stench of insider trading. Isn’t it great when you can come up with a scheme that enables you to charge twice for something and get away with it. Corruption writ large.. So a hospital runs its generators and provides its own electricity, it cannot feed into the grid, only its own load. 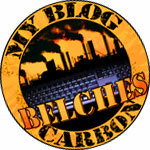 For that it gets the relevant feed-in tariff. Many times what it pays the area supplier. Nice.